Beating The Market With 20% Returns. Reviewing Our 2016 Stock Grader Portfolio. Pick the best value stocks with our Stock Ranks, screening and valuation tool. Try the live demo today. Does the OSV Action Score Really Identify the Winners? What is Old School Value? To get this kind of information and other exclusive articles before regular readers, get on the VIP Mailing List today. 2016 was the first year our Old School Value stock grading system we dub the “Action Score” on our stock analysis software, took to the streets. What is an “Action Score”? In a nutshell, it’s a set of 9 (mostly value based) metrics used to score a stock between 0-100. Stocks are then graded based on their scores. Stocks receive the following scores and grades. Stocks with the highest scores should receive higher priority and attention, thereby requiring “Action”. Action refers any of the following: reading, thinking, looking up numbers, studying competitors, getting differing opinions, buying or selling. The #1 goal of the Action Score is to reduce the time spent trying to find ideas. If you believe in the 80/20 rule, you’ll see that you tend to spend 80% of your time looking for stocks. Less (much less) than 20% of the time is spent on analyzing, thinking, valuing and learning about companies. The #2 goal of the Action Score is to utilize a mix of uncommon metrics and fundamentals to create a quantitative strategy for people who are short on time, yet enjoy the DIY investing approach. As it is too long to cover everything in detail again, here are the links you should visit to get a better understanding of how the system works. There are two sets of numbers I’m reporting today. One is based on the backtest. The other is a more “realistic” version. Previously, when I read academic papers with backtested performances, I took it at face value. Didn’t think much about the details. But spending more than 2 years to build OSV Online and the Action Score opened my eyes to areas you don’t think or know about. The truth is that academic papers and results are just that – academic/theory. The results are the upper range you should ever expect, provided everything goes perfectly. In the real world, there are variables and challenges that are not considered with theoretical backtests. These simple points alone can chop 10% off the theoretical results. That’s why I created a manual version of the portfolio to track. It was’t perfect, but it gives you another look at what type of returns you can expect to receive. An OSV Member did the same thing and I’ll share the list he sent along and how it did. There’s a lot of numbers and tables here so let’s get to it. This is the fun part. There are two main methods of calculating returns with backtested performance. Action Score is tested against the entire universe. This includes all sectors and exchanges. Action Score is tested against a filtered universe. No OTC, financials, miners, utilities. No limit on market cap and stock prices. The first one I call “Full Universe”. The second I call “Filtered Universe”. 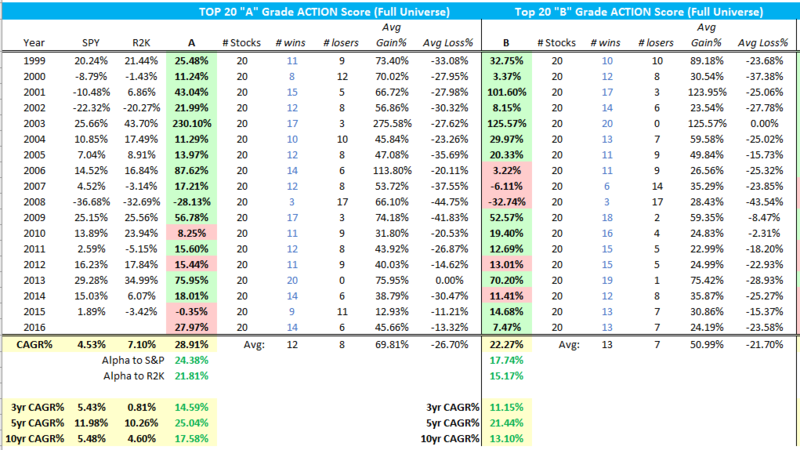 Each portfolio is backtested by picking the Top 20 Action Score stocks at the start of the year. If there are only 12 stocks with an A grade, the last 8 will be B grade stocks. Doesn’t all have to be A’s. Just the top 20 highest scores. Over an 18 year period, it has achieved a CAGR of 29.65%. The 3, 5 and 10 year CAGR is impressive though. Using the rule of 72, a CAGR of 29% means you’ll double your money every 2.5 years. At 18%, you double your money every 4 years. Now what does something more “realistic” look like? That’s where the filtered universe comes into play. In 2016, the Action Score for the filtered universe achieved an 8.12% price return. No slouch, but nearly 20% less when you eliminate OTC, financials, miners and utilities. Nevertheless, the CAGR over the past 18 years using this filtered universe comes in just shy of 20%. If you compare the two tables, the individual 2016 Q,V,G performances were close to the market. The difference was that the Full Universe Value stocks soared with a 57.8% return compared to 18.12% for the filtered universe. The full universe had 3 resource companies making up the bulk of the gains as the resource sector bounced back in a huge way. This question comes up regularly which I answered in a post titled fittingly, “Does the OSV Rating System Really Work“. What people mean by this is whether the algorithm properly identifies the A grade stocks with higher stock performance than B,C,D and F stocks. December of 2016, a new OSV Insider with a background and black belt in statistics, asked and wanted to know the same thing. I could try and do the same tests and provide as much info as possible, but in the end, it’s an algorithm I created for which I could be easily biased. Right? Well, George (OSV Insider) ran exhaustive tests, cross validations and scenarios to verify the Action Score. I’ll be sharing the full report with you later on but here’s a snippet that answers this question based on the filtered universe. 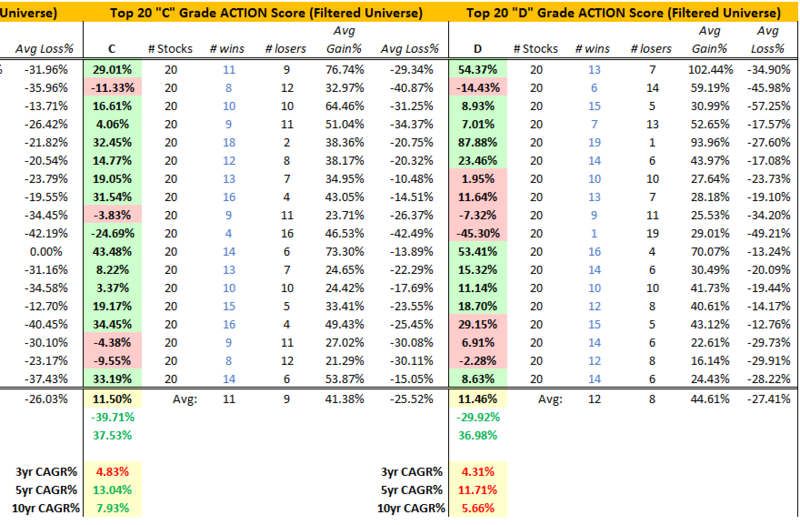 Having validated the Action Score and backtested their performance, I wanted to better understand the holistic performance of the Action Scores, rather than focusing only on the subset of annually top 20 ranked Action Score stocks. If the Action Scores represented a fundamental association between superior financial statements and higher annual stock returns, then we should expect to see that as Action Scores increased through the full range from 0-100, the annual stock returns should increase on average as well. Each gray point is the average annual return for a single selection of 20 stocks going from the lowest 20 Action Score stocks to the highest 20 Action Score stocks. As the variability in the returns were quite large, I applied a moving average (500-unit window) across the Action Scores to smooth out the returns in order to capture the general trend (shown by the blue line). We can then clearly see that the average annual returns gradually increase as Action Scores increase, with the lowest amount of variability (spread of gray points) and highest overall returns in the upper ranges (>80) of the Action Score. In fact, there are very few gray points below the red line (average annual return of 0%) for Action Scores above 80, while in contrast, there are much larger proportions of gray points below the red line for Action Scores below 20. George took the data for the filtered universe (even found an error with the 2015 results), and ranked all the stocks from all the years and plotted the average annual returns using a sliding window of 20 stocks from the lowest Action Score to the highest 20 Action Score stocks. This is my simpler version organized by grades for the Top 20 in the Full Universe. There are lots of numbers and charts so I’m making this spreadsheet of results available for download at the end of this report. Notice the Top 20 A grade has a CAGR of 29% and drops down to 10% by the time you get to the D’s. Same thing with the filtered universe. 20% CAGR with the A grade stocks. D grade portfolio returns 11.46%. Here’s an expanded look at the tables to show the number of winners and losers for each grade and the average gain/loss. As I mentioned near the beginning, I’m going over results for the “theoretical” backtested portfolio and a “realistic” portfolio. This is the “forward looking” model portfolio to see how it could work in real life. To create this portfolio, I looked up the Action Scores at the beginning of the year and added 20 stocks that I figured an investor could accumulate to initiate a position. Again, it wasn’t very scientific. Definitely a quick job in creating each Top 20 model portfolio. If I didn’t have enough stocks to make up 20, I moved down the list and grabbed the next one to fill it up. OUTR was bought out and was replaced with another stock, but I didn’t enter the transaction properly so the gain from OUTR was not included. 3 stocks were very thinly traded that could affect the final results. there were stocks I didn’t want to add like ZAGG and PERI which ultimately came last. But the same thing could have happened with a winner. +10.86% on the year. This is price return, so total return wise, it’s the same as the market. Plenty of names that I would never discover on my own. The value model under-performed with an end result of 3.52%. About 8% below the market. Some stocks like ZAGG show up multiple times. But doesn’t mean the stock is a guaranteed winner. Growth beat quality and value in 2016. The term I use for growth in the Action Scores is not related to EPS growth. Growth is based on top line growth and asset utilization growth. It’s the idea that an increase in efficiency and operations leads to an increase in sales and profits. Therefore we look for gross profitability as researched by Robert Novy-Marx. It’s good to see OSV Insiders thinking and questioning the methodology. If you are going to leverage the Action Scores, it’s better to test and see how it works. Kirk is another member who wanted to test out the performance and did a better job of tracking than I did. Here’s the end result of what he tracked. Kirk kept things real simple and clean and ended with a 16% model portfolio. Looks like there weren’t enough to fill up 20 stocks. Ended up with 19. If you made it this far and went over the numbers in detail. Congrats *high five*. To make it easier, here’s the link to download the spreadsheet with all the data and more. You can see it for yourself how certain performance numbers are calculated. Overall 2016 was a great start with the launch of OSV Online and the final performance. Based on the results to date, I hope that you are interested in the Action Score. If you want a quant driven tool to quickly find or present you with a basket of ideas, you’ll find how easy your research process becomes. If you are relatively new to picking stocks, the tool provides hand-holding where necessary. If you are a die-hard analytical investor, use the Action Score as an idea generator and perform your own valuations and deep analytics with our models. Makes my day when I get emails like this because only if you win, I win. The demo is live where you can look up the details of AAPL, MSFT and BAC for each feature. Once you sign up and look up a stock, you’ll see this part in the dashboard. Click on the grade, scores or bar and you’ll be able to see the details of the numbers that make up the algorithm. Check out the live preview and once you get inside, you’ll be able to look up our database, scores, ratings and all the goodies that come along with it. The 2017 model portfolio I am tracking to beat the market is also available to view. I go over how to build and select stocks for the portfolio using the Action Scores. Old School Value is a suite of value investing tools designed to fatten your portfolio by identifying what stocks to buy and sell. It is a stock grader, value screener, and valuation tools for the busy investor designed to help you pick stocks 4x faster. Check out the live preview of AMZN, MSFT, BAC, AAPL and FB. We are driven to provide useful value investing information, advice, analysis, insights, resources, and education to busy value investors that make it faster and easier to pick money-making value stocks and manage their portfolio. © Old School Value. All Rights reserved. Disclaimer: Old School Value LLC, its family, associates, and affiliates are not operated by a broker, a dealer, or a registered investment adviser. Under no circumstances does any information posted on OldSchoolValue.com represent a recommendation to buy or sell a security. The information on this site, and in its related application software, spreadsheets, blog, email and newsletters, is not intended to be, nor does it constitute, investment advice or recommendations. In no event shall OldSchoolValue.com be liable to any member, guest or third party for any damages of any kind arising out of the use of any product, content or other material published or available on OldSchoolValue.com, or relating to the use of, or inability to use, OldSchoolValue.com or any content, including, without limitation, any investment losses, lost profits, lost opportunity, special, incidental, indirect, consequential or punitive damages. Past performance is a poor indicator of future performance. The information on this site, and in its related blog, email and newsletters, is not intended to be, nor does it constitute, investment advice or recommendations. The information on this site is in no way guaranteed for completeness, accuracy or in any other way.